Yet another hour packed with so much to like. Maybe it's because I lived through the era and am actually cognitive of the times that I so connect with what's happening. 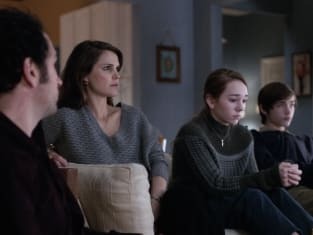 Regardless, The Americans Season 4 Episode 9 hit me hard. By the time the credits rolled, I felt just as down as I had felt after watching The Day After, but for very different reasons. Using that movie as a sign of the times, especially since the people we are dealing with weekly are supposedly trying to stop nuclear disaster and its fresher, biological counterpart from happening was brilliant. Showing that everyone was watching the movie, right down to Oleg and his lover, was right on the mark. I noted earlier that The Day After was the most watched movies of the week of all time. Similarly, there was a movie in Europe titled Threads to scare the pants off of our friends over there. Everybody was on high alert. Paige: That movie was pretty real, right? Philip: That's why your mother and I do what we do. To keep stuff like that from happening. Permalink: That's why your mother and I do what we do. To keep stuff like that from happening. Philip used it to reassure Paige they were in the right family business. He did so even as he continued to question their goals himself. Philip's friendship with William is wonderful. When we first met William, I thought he was a turned agent. Knowing he's a born Russian in the same situation as Philip and Elizabeth makes so much more sense. They can share things about their situation with each other that nobody else understands. William: Where've you been? They told me all communication should go through the Center, not you. Philip: We've been on a break. William: A break? We get breaks? Permalink: A break? We get breaks? Dylan Baker is uniquely suited for roles such as this one, with his quirky demeanor and ability to deliver snarky comments that are also, somehow, affectionate. He contacted Philip again, as a friend, circumventing Gabriel, with big news. The killer strain they'd been waiting for had arrived on Level 4. Philip wondered if he wanted to keep it quiet, why did he bother calling? It's a big decision to make alone. The trust is there. It feels fright from here, too. Interestingly, if it were up to William and Philip, they'd leave that killer strain right where it belongs, on Level 4. They believe that some things should stay out of Russian hands. They don't necessarily have all they faith they should in their people. William has seen the garbage (literally) he uses to deliver samples to his sources. It's not really the best thought of plans, and disaster is probably only a loose thread away. Philip has a great out for Elizabeth, too. Keep her friendship with Young-Hee. Cherish it, her very first, and let the Americans develop the vaccine to the killer strain. Trust them, for once, to do the right thing, and then they wouldn't have to play with fate. But Elizabeth is still more Red than she is Red, White and Blue. What followed was horrific and nauseating. It seriously brings tears to my eyes to think back on what Elizabeth did to Don. Setting him up, using his goodness against him, all in her attempts to get into Level 4. Hell, I didn't even realize they were the Level 4 link! When all was said and done, and Don was humiliated and Elizabeth lost any hope of ever seeing Young-Hee as a friend again, she merely told Philip, "I'm gonna miss her." We all will, Elizabeth. Mutually assured destruction. Mission accomplished with that one. In other ironies, Philip and William noted their jealousy of Martha's freedom in Moscow. She's as free as they are in America. Surely they're aware of that. More likely it's freedom of the Nina variety, but they've fooled themselves into thinking she's ridden off into the sunset. Paige is at once learning to be free, by getting her driver's license, and still as tied down as ever with her own familial duties to Pastor Tim. Pastor Tim will be heading to Ethiopia for some sort of charity trip, for which Elizabeth and Philip made all the arrangements, but when he gets back, he wants a sit down with the Jennings. He's noticed Paige is a little blue. He's still under the assumption he calls the shots. Maybe his trip will give Paige a little break. While her parents were on theirs, she had to suffer through her first period of ON time in the family business. That's tough. She'll still have Alice, though, and probably some hand holding to do while her Mister is away. Maybe they can focus on the baby. I don't think we've seen the last of Young-Hee. I'm worried about that family now. Hopefully, Don won't commit suicide out of shame. I'm concerned Young-Hee might confront Elizabeth in a way she cannot defend and wondering if Elizabeth picked the wrong mark. It would be nice if Young-Hee turned the tables on Elizabeth in some way. I don't want Elizabeth to get away with this one.They allowed us to see too much of their friendship, and too much goodness in Young-Hee to feel alright with Elizabeth's choice. Philip gave her an out. She should have taken it. What do you guys think? How did "The Day After" hit you? 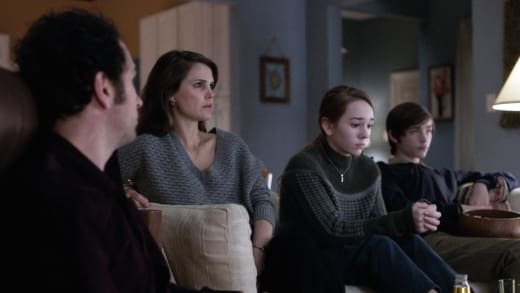 Take to the comments and watch The Americans online if you need to catch up! William: I don't trust us with us. 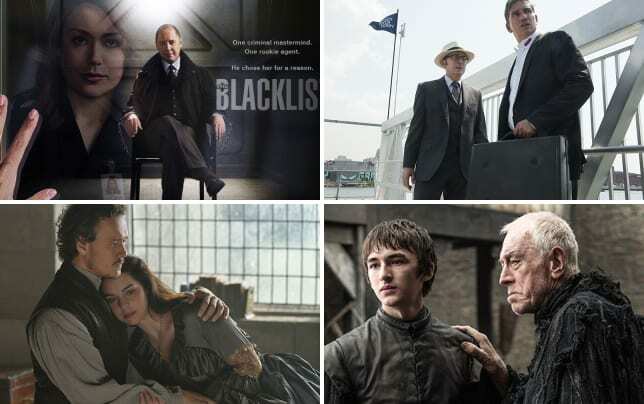 Philip: Do you trust the Americans? William: No. On the other hand, the threads on their seams work most of the time. Permalink: No. On the other hand, the threads on their seams work most of the time.